Students go hands-on with chemistry and art. Art fraud and forgery have been around as long as the discipline of art itself, causing international headaches for museum curators and historians. How are they to know if a classic masterpiece is just that, or an extremely accurate (and far less valuable) copy? 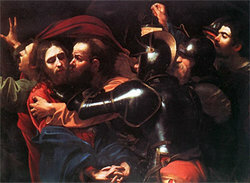 The Taking of Christ (shown above) was investigated for approximately two years after being discovered in the home of Jesuit priests in Ireland. The work underwent intensive cleaning and chemical analysis of its glue, paint, and canvas pigments for verification of time period and region of origin. After a combination of chemical tests and examination by a curator skilled in recognizing the painting characteristics of Caravaggio, the work was deemed legitimate. Although science cannot undeniably prove that the work was painted by Caravaggio’s hand, it places the painting in the correct historical and regional contexts and reveals consistency with the type of paint and canvas used in other Caravaggio pieces. Learn more about art conservation at the Metropolitan Museum of Art in New York City. Chemistry and art? Together? Are they not the oil and water of the academic world? I was intrigued and quickly registered for it. This course certainly was unconventional. First, it was taught by two professors: Gary Wells, associate professor and chair of art history, and Michael Haaf, associate professor of chemistry. 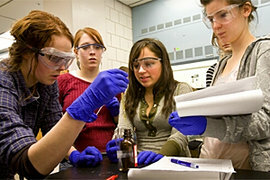 The twice-weekly class was almost always divided by subject: Tuesdays were reserved for art history, and Thursdays were designated for chemistry. On art history days we examined the historical and cultural backgrounds of paintings, sculptures, and artists, as well as the artistic contexts of scientific principles and chemical discoveries. We learned, for example, that there was an outstanding presence of the color purple throughout the impressionist movement because it was during that period that the first synthetic purple paint became widely available. During days focused on chemistry we learned not only chemistry basics but also what the subject can reveal about art. Scientific tools such as X-ray or infrared analysis allow historians and scientists alike to date ancient paper and canvas. In our labs we created artwork with scientific equipment instead of with paints and paintbrushes. We created our own printing plates using a process called etching, which involved engraving a design on a piece of copper and placing it in acid to form a kind of stamp. See how to make silver different color by electrochemical anodizing. In another lab we used an electrical current to change the properties of a piece of wire. The wire changed from its original slate gray to a bright sky blue, to a deep purple, to a hot pink magenta. The higher the voltage, the more the color changed. These transformed pieces of wire were then fashioned into our own pair of fashionable and educational earrings. 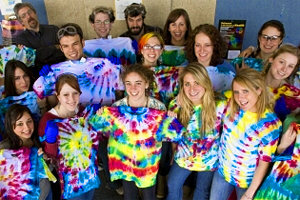 Other labs involved the creation of our own pigments (the tiny particles that give paint its color) and that favorite summer camp activity -- tie-dying. In addition to creating artwork in a laboratory setting, we took our newly acquired knowledge on the road to the Metropolitan Museum of Art in New York City, where we explored the scientific department and conservation labs. We observed conservators restoring ancient Islamic art and scientists using the same equipment that we used in our own labs to analyze the structure of molecules. I guess the echoing question of “when will I ever use this” does have an answer. The trip, and this class, gave me a glimpse into a possible career that I had never previously considered -- art conservation. Most undergraduates are not exposed to art conservation because such classes are typically offered at the graduate level. As a freshman I not only had the opportunity to learn about conservancy but was also able to explore one of the biggest conservation labs in the country at the Metropolitan Museum of Art, making me one very lucky student. I have a feeling Chemistry and Art will end up being one of the most interesting courses I take as an undergraduate. It successfully satisfied my personal curiosities in the field of art conservation as well as my intellectual desires to find a practical unity between two seemingly different areas of inquiry. Finding and exploring these commonalities in our world are the true definition of learning and knowledge.